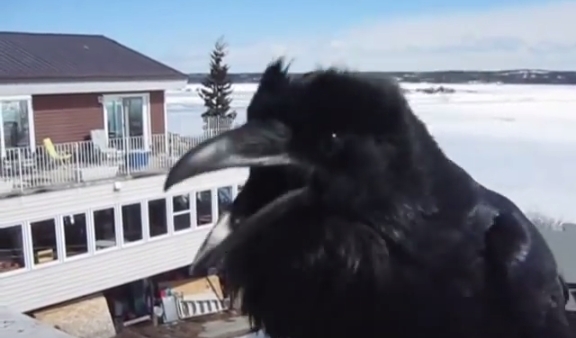 Raymond the wild raven has obviously picked up some interesting sounds and he definitely seems to be enjoying being an entertainer with them! The raven also has a prominent role in the mythologies of the Indigenous peoples of the Pacific Northwest Coast, including the Tsimishians, Haidas, Heiltsuks, Tlingits, Kwakwaka'wakw, Coast Salish, Koyukons, and Inuit. The raven in these indigenous peoples' mythology is the Creator of the world, but it is also considered a trickster god. For instance, in Tlingit culture, there are two different raven characters which can be identified, although they are not always clearly differentiated. One is the creator raven, responsible for bringing the world into being and who is sometimes considered to be the individual who brought light to the darkness. The other is the childish raven, always selfish, sly, conniving, and hungry. Responses to "Raymond The Wild Raven Comes To Talk With Old Man (Part 2)"